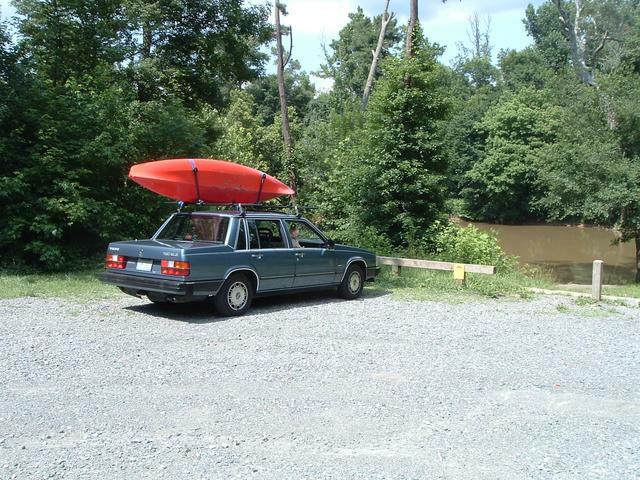 Put In - The Roberson Creek canoe launch is just below the last rapids on the Haw River as it flows into Jordan Lake. To get there, drive west across the lake (toward Pittsboro) on Hwy. 64. Six miles west of Wilsonville (64 and 1008 stoplight) you'll cross the Haw River. At 0.9 mile after the Haw, turn left on SR 1944 (Dee Farrell Road). It will shortly deadend into SR 1943; turn left on SR 1943. After 1.0 mile of traveling southeast on SR 1943, look for a gravel road on your left with a sign directing you to the Roberson Creek canoe launch site - not to be confused with the Roberson Creek boat ramps farther on down SR 1943. Trip Directions - Nice to head upstream in the three different sections and check out the last set of rapids on the Haw River. Then head downstream till you see Robenson Creek on the right. Motor boats will start appearing now. I paddled down to the Robeson Creek Boat Ramp and had lunch, then headed up the creek past the bridge and then looped back to the put in. Noticed on the way out all these two liter bottles floating around the put in and up to the first set of rapids. After checking them out it seems they are a method to fish for catfish by tying a line and hook to the bottle and just dropping them around. I ended up cleaning them all up, had one with a catfish on it and released. What a mess really. Also found an access road but it lead to private property so turned around. Would make a nice lunch stop however. Scenery - Lots of birds, turtles, and flora. Really nice trip over all. Hazards - Rapids and motor boats. Tried to surf a few rapids and quickly found out this boat does not do well with rocks on the keel. You basically are almost flipped over.